Because we have extensive experience in performance auditing, we emphasize both theory and practice. Eight of the 15 chapters are devoted to performance audit of specific governmental functions and programs. The book is full of illustrations drawn from actual audits. That's why we call the book ...Audit in Action. Because we are publishing this book ourselves, we can customize it to your needs. We will sell either the entire book or any chapters you wish. For example, if you teach a course in financial auditing and want to give your students a general understanding of internal auditing, we can put to together, say, five or six chapters to cover the subject. Although we emphasize governmental auditing, the concepts and practices are readily transferable to the not-for-profit and business sectors, particularly if you select specific chapters. 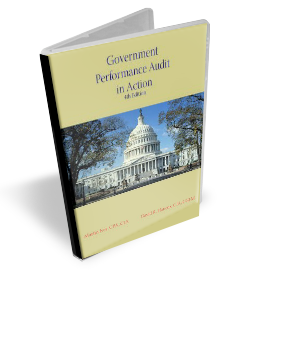 The first definitive textbook on government performance auditing! Updated with the latest audit standards, internal control guidance and reflecting current issues in the profession. Written by two practitioners who meld the theory of auditing with practical examples that bring the concepts alive! Government performance auditing is a relatively new subject. Having worked and taught in this field for many years, we have written a textbook specifically designed for undergraduate and graduate students majoring either in accounting or public administration. This book also is appropriate for staff in government audit units searching for definitive guidance on doing highly effective performance audits. After functioning as an accountability professional for more than four decades, in both the private sector and the public sector, I have developed strong views on the topic of accountability. Accountability is fundamental to the effective functioning of a representative democracy – where citizens grant critical decision-making authority to their elected representatives. Public accountability allows citizens/taxpayers to hold government officials (both elected and appointed) to account for their stewardship and use of taxpayer resources. It informs citizens so they can better exercise their voting rights and responsibilities. Governments differ significantly from for-profit businesses, especially in their basic mission or purpose. In addition, there is no universal “bottom line” measure of performance results in the government sector that is similar to either net income or earnings per share in a business enterprise. Therefore, measures of government accomplishments or performance results are usually identified for specific government services or specific programs. Performance management continues to be an evolving discipline among government officials. Unfortunately, many governments do not have strategic plans with priority goals and objectives clearly identified. Also, governments frequently lack adequate resources assigned to performance measurement and accountability reporting of actual accomplishments. In such an environment, performance audits help fill the void and provide focused objective assessments of the efficiency and effectiveness of specific programs and services. Performance audit reports provide essential public accountability to citizens. The reports assist taxpayers to understand how government officials are using resources and help taxpayers to determine whether they are getting value for the dollars being spent. In this important textbook, the authors have provided a comprehensive overview that explains the concepts and basic principles underlying performance auditing. They also document the performance audit process and provide extensive illustrations and case studies to emphasize how performance audits are accomplished and what they can achieve. This textbook is a timely and relevant addition to auditing literature with a much needed focus on public accountability. Much of what a good manager should be doing in monitoring and assessing performance results in his/her areas of responsibility is no different than what a performance auditor does. Therefore, this text will be of value not only to students of performance auditing, but also to managers at all levels of government. I am confident this book will be of utmost value to all aspiring accountability professionals. The biographical profiles of the two authors, Martin Ives and David R. Hancox, confirm their qualifications for writing this book. I have worked with both of them at various stages of their careers and I know them as talented professionals. Both authors have many years of government experience and that brings a very pragmatic perspective to this commendable textbook. Mr. Attmore is the former Chairman of the Governmental Accounting Standards Board, Deputy State Comptroller and State Auditor of New York, Director of Internal Audit, and a Senior Manager with an international accounting firm. He is a graduate of Villanova University, a certified public accountant and a certified government financial manager. Martin was an adjunct professor of public administration at New York University and Pace University. He has served as First Deputy Comptroller of New York City, Deputy Comptroller of New York State, Vice Chairman and Director of Research of the Governmental Accounting Standards Board, Member of the Federal Accounting Standards Advisory Board, and Deputy Assistant Chief (Audit Operations) of the U.S. Army Audit Agency. He was founding president of the Albany Chapter of the Institute of Internal Auditors, president of the Capital District Chapter of the American Society for Public Administration, and a member of the Professional Certification Board of the Association of Government Accountants. Mr. Ives is co-author of two books published by Sheshunoff Information Services: Program Control and Audit: Handbook for Managers and Auditors and Financial Condition Analysis and Management. He is also co-author of Introduction to Governmental and Not-for-Profit Accounting (Prentice-Hall). He has spoken and written frequently on financial management, accounting and internal auditing and has written chapters for books on internal auditing and municipal finance. Mr. Ives has received the Public Service Award from the Fund for the City of New York, the Joint Financial Management Improvement Award from the Federal Government, and the Governor Charles Evans Hughes Award from the American Society for Public Administration. New York University’s graduate students have also honored him as Adjunct of the Year. David was Director of Audits & State Expenditures for the New York State Comptroller’s Office. He is on the faculty of Siena College and the Government Audit Training Institute – Graduate School, USA in Washington D.C. He teaches courses on internal and performance auditing and management controls. He previously taught auditing at the Sage Colleges, Albany Business College and Schenectady County Community College. Mr. Hancox is co-author of Program Control and Audit: Handbook for Managers and Auditors (Sheshunoff Information Services). He is a past regional vice president of the Association of Government Accountants and a past president of the New York Capital Chapter of that organization. He is also past president of the Albany Chapter of the Institute of Internal Auditors. Mr. Hancox is a frequent speaker on audit-related topics and has contributed articles to various professional journals including The Internal Auditor, the Government Accountants Journal and the Corporate Controller. He’s listed in Marquis’s Who’s Who in the World, Who’s Who in America and Who’s Who in the East. In 2005 and 2015, he was selected as the Educator of the Year and in 2007 he received the National President’s Award from the Association of Government Accountants.